Just a quick update on Browserling. 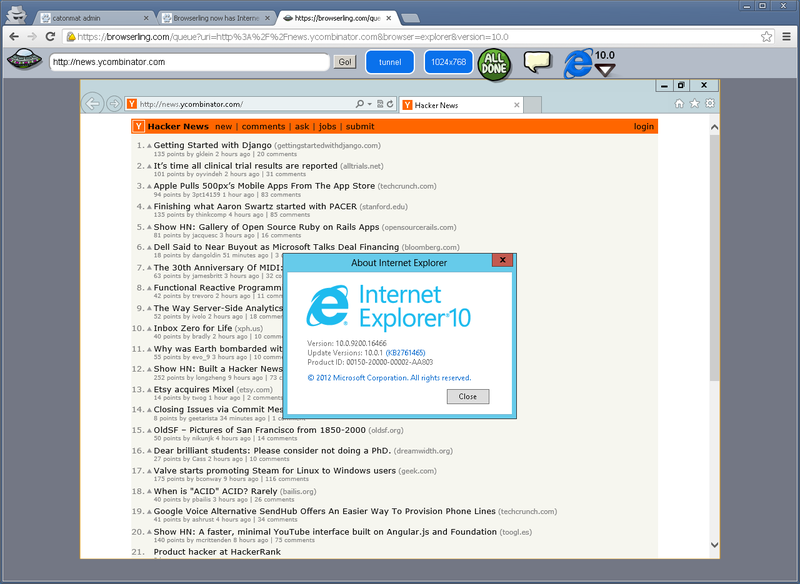 We just launched IE 10s! IE 10s are available to all our paying customers. The free browserling version offers IE 9. Next we're getting Mac OSX browsers and iPhone emulators. Stay tuned! Follow us on twitter for updates - @browserling, @testling, @substack, @pkrumins. Browserling is an interactive cross-browser testing tool. It lets you test your website in older Internet Explorers such as IE 6, IE 7, IE 8 and IE 9, IE 10, Firefox, Chrome, Opera and Safari!